This photo is from Sunday, but it tells you all you need to know about the Padres right now. 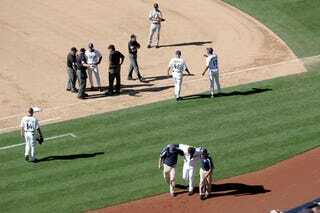 Milton Bradley being helped off the field, his season ended due to injury after a run-in with an umpire. San Diego had already lost center fielder Mike Cameron to an injury, meaning that two-thirds of their starting outfield is now kaput. And worse, the Padres lost to the Giants on Monday, 9-4, meaning that Philadelphia has now pulled even with them in the NL wild-card chase. Man. In the words of the immortal Daffy Duck: "I demand that you shoot me!" Not only that, but San Diego must also worry about Colorado, just a game back in the wild card. The Padres are three games behind NL West-leading Arizona. All have six games remaining. On Monday the Padres lost to Barry Zito, of all people, who even singled in a run as he earned his first career win in seven tries against the Padres. Earlier in the day, the Padres learned they will be without left fielder Bradley for the rest of the season because of a knee injury that will require surgery. Bradley was hurt after being spun to the ground by manager Bud Black, who was keeping him from going after umpire Mark Winters. If you have to ask, just skip it. • Judge Judy, Prepare For Your Most Baffling Case Yet. Barry Bonds promised that he would release the hounds on anyone who defamed him, and on Monday he has, evidently, chosen his first target. Curt Schilling! Prepare to be roughly sued about the head and shoulders, Mr. Schilling! "This is directed at Schilling more than anybody," Bonds' attorney Michael Rains told the San Jose Mercury News. "Schilling said some things that were inappropriate and potentially defamatory." As the story goes on to say, we're all sure that Bonds wants this to go to trial. Yes. Totally. • Why, Mr. Met? Why? The Mets' so-called magic number remained at five on Monday as the Nationals spanked them 13-4, New York dropping to two games ahead of idle Philadelphia in the East. The Mets play the Nationals again Tuesday while the Phillies play host to Atlanta in the opener of a three-game series. • Turn Those Machines Back On! Well, after a 2-0 loss to Minnesota on Monday, Detroit is 5 1/2 games behind the Yankees in the AL wild-card race, with six to play. Carlos Silva (7 2/3 innings) got the win.